Gear up for the new recruit class and keep all essential gear in one convenient place using an 90900 Academy Bag from Strong Leather. 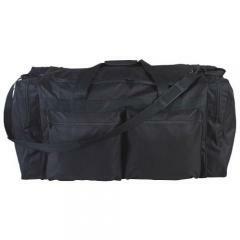 Strong's duffel is constructed from 600D polyester fabric for a sturdy frame that is easy to maintain. One large, central compartment offers plenty of room for stashing larger objects, while smaller accessories and necessities can be layered in the two front or side pockets for greater organization. Step into the academy fully prepped for anything training may throw at you and get ready to hit the books!